Interesting discussion. There must be paperwork and drawings for the conversion and mods. I wonder if they still survive? Thought a little background explanation as to the allotment of two TBFs to Nausori (Fiji) might be in order. The original RNZAF unit in Fiji (apart from the HQ in Suva) was Unit 20, although correct designation was Detached Flight Nadi, equipped with four Dragon Rapides (DH 89) and one DH Moth. After destruction of two Rapides (and the Moth) in the hurricane of February 1941, the surviving two DH 86s were shipped up from NZ as replacements, plus another Moth. The DH 89s and 86s were used as operational search and attack aircraft in the early years, and they were supplemented by nine Vincents (actually 8 Vincents plus one Vilde), which arrived in Sept 41 (six) and early 1942 (3). Also four ex-RAF Singapore flying boast arrived at end of 41 (became 5 Squadron), and about this time the Detached Flight was renamed No. 4 Squadron. On 9th December 1941 the first Hudsons arrived in Fiji (for 4 Squadron, Nausori and Nadi) and undertook most of the longer patrols, the Vincents and Singapores being retained for the closer in patrols, at least till the end of 1942/early 1943. Also the surviving DH 86s and 89s became used purely for communications duties, probably from mid to late 1942, and after six Vincents were shipped back to NZ at end of 1942, the last three of this type in Fiji were used purely for drogue towing and meteorological flights. The DH 86s and 89s, plus the three Vincents constituted what became known as the Communications Flight, Nausori, and this arrangement remained more or less intact till the end of the war (early DH 89s and last DH 86 replaced by an additional DH 89 Dominie from NZ), although both 4 and 5 Squadrons (by now with Venturas and Catalinas) had by this time been moved further north to keep up with the Pacific War, although Venturas remained on operations from Nausori until March 1945 with other squadrons operating the a/c left here by 4 Sqdn. The two Avengers were flown up from New Zealand as noted by Paul in Sept 1944 as replacements for the last two Vincents (NZ307, 309 from memory). I have photocopied the Fiji TBF pages from the logbook of an experienced TBF pilot (W/O J H Pope) who seems to have been one of the main pilot of the these aircraft in Fiji. 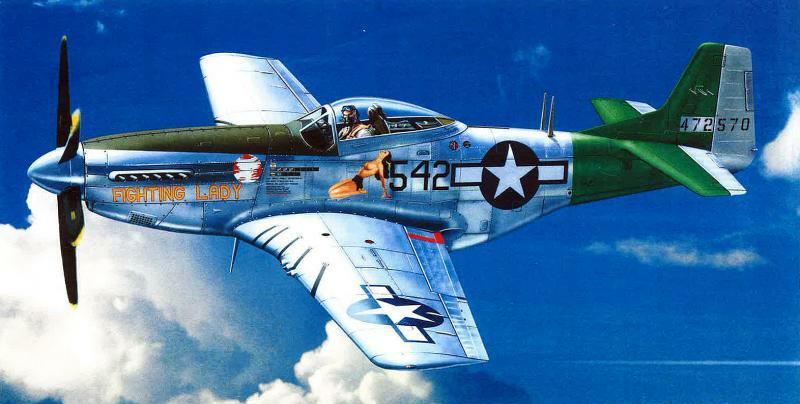 He had flown Hudsons from Guadalcanal in 1943, then briefly with 25 Sqdn (Seagrove, SBDs) and was then to have gone north with 30 Squadron in January 1944, but for reasons unknown, did not. Least there be any doubt that the two TBFs despatched to Fiji in September 1944 were intended for drogue towing and met flights, the following quotation is sourced from the Air Department file concerned with allotment of RNZAF TBFs (Air 27/1/187), signal dated 6th September 1944: :"Avenger TBF-1C aircraft NZ2527, NZ2539, allotted from Hamilton to Comm Flight Nausori. Allotments 5624, 5625 refer respectively. 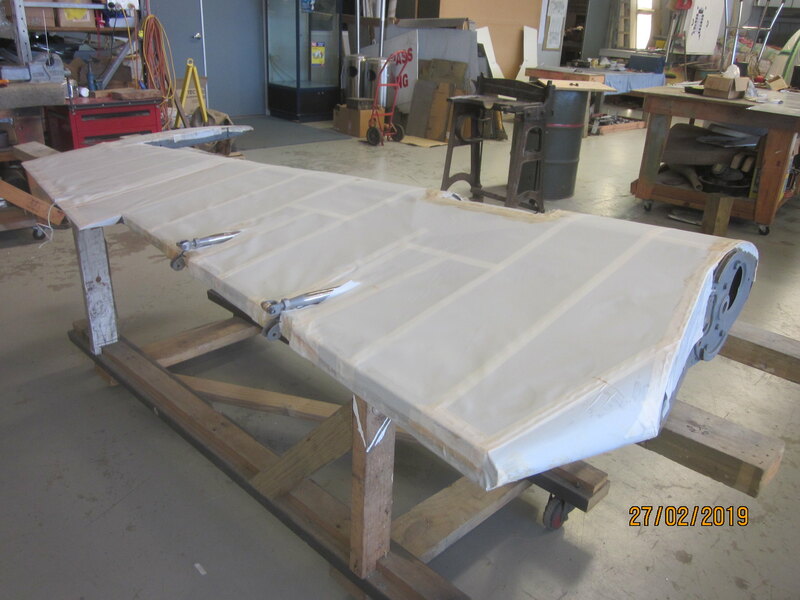 These aircraft have been modified for drogue towing and are to be despatched complete to airframe inventory. Crews are to be arranged by Director of Operations. Advise date despatched. Although meteorological flights not specifically mentioned in the above quotation, this was a secondary duty which is mentioned in other documents in the file, as well as in Nausori ORB. A total of up to twenty TBFs were called for under this drogue tower programme, all to be fitted with electric winches, of which 20 supplied to Rukuhia. Permission had to be sought from COMAIRSOPAC for these conversions to be undertaken, as he was the local operational theatre commander (United States Navy) and, strictly speaking, their employment and disposal was entirely at his discretion. For operational purposes the RNZAF had little to no control over the movements and employment of "our" Lend-Lease aircraft, and trained aircrew and ground staff in operational squadrons (including servicing units), and the RNZAF's main responsibility was to see that units were ready to be deployed forward to take their place in the Allied Forces controlled by COMAIRSOPAC (theatre operational air commander) by the date already agreed to. Another responsibility was for RNZAF to supply attrition replacements for men and machines if and when this might be necessary. Confusion seems to have been introduced by the allotment details of RNZAF aircraft as compiled by our own late Editor of the AHSNZ, Cliff Jenks, and there is nothing wrong with these lists that I can see, but careful interpretation is required. Just found out that I have all J H Pope's flying entries EXCEPT that undertaken from Nausori - will have to remedy that deficiency very soon! Over the last couple of work days some of the team has been seconded to work on an engine while the rest of us carry on with our current jobs. Bob and Alan are working around the engine section whilst Deon, Mike and a couple of new people are working away in the bomb bay, Lance and Cal are beavering away on the rear of the cockpit. 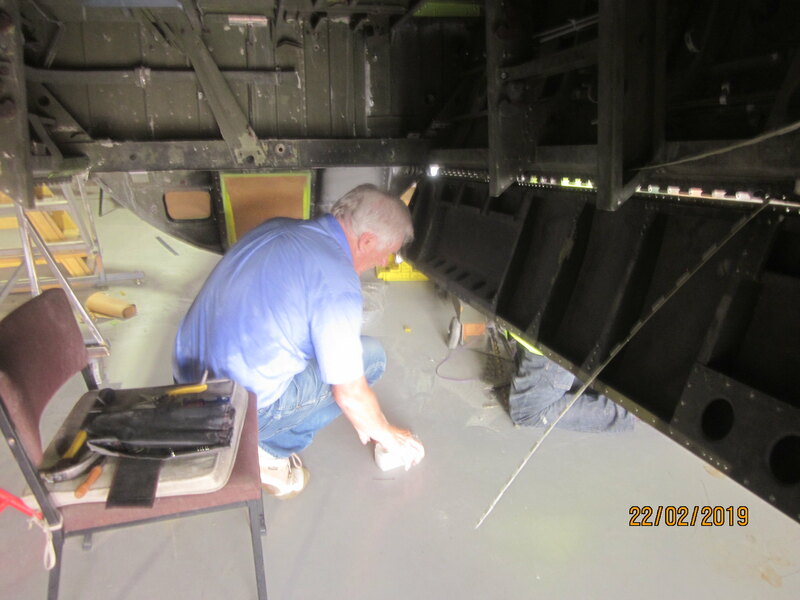 Colin and Jim have made a start on the outer bomb bay doors and are removing some of the corroded metal and replacing sections and are figuring out how to straighten one of the doors which has been bent. The inner doors are still being cogitated over but I suspect that we will be making wooden ones in the near future as they are like hens teeth. 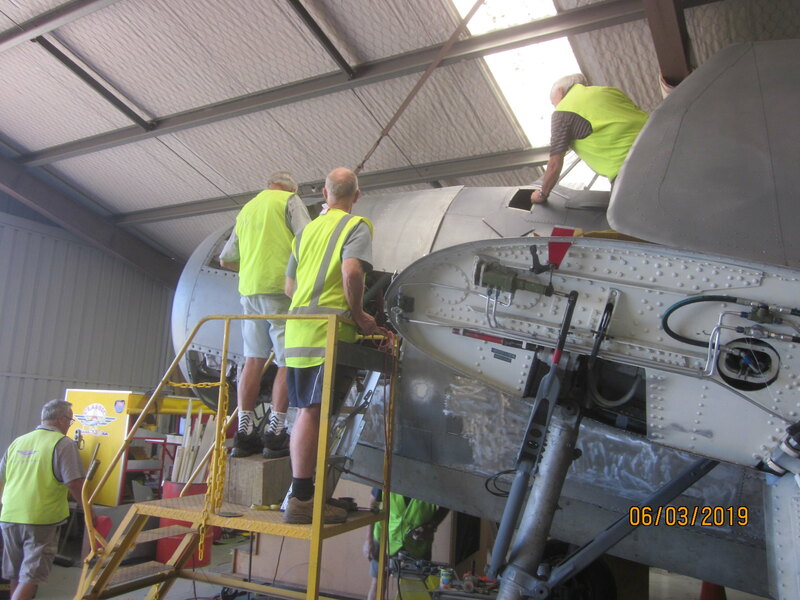 Des is riveting up last of the tail plane and I spent most of my time in the rear compartment sanding, scraping and washing the inner surface ready for some paint - what a bugger of a job there are so many pieces of metal and rivets to work around. 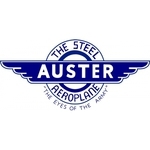 Our Hudsons still flying in latter part of WW2 generally had their turrets removed too, and they likewise had a thick steel plate bolted into that position (normally covered by a sheet steel fairing) for CoG purposes. Well a lot of info has flowed in the few days since my post on trying to establish whether NZ2539 wore an "E" on the fuselage. Today I came up with the answer. I found another photo and I see that the one referred to earlier was a cropped one of today's find of three Avengers in flight. The "E" aircraft on that photo is NZ2506. End of story. The 'wrap around" yellow and black stripes on NZ2539 for the TT scheme appear to be an RNZAF colourscheme. The RAF TT scheme as detailed in AP 2656A Vol 1 Sect 7 and amended by AL 8 of October 1944 has the standard camo scheme on the upper surfaces with black and yellow stripes on the undersurfaces at 60 degree port to starboard alignment and each stripe 3ft wide. (that general alignment appears to have been folowed on NZ2539) the undersurface of the tailplane was black, with the elevators yellow. I have yet to see the USN equivalent scheme. I am away in Wellington for a week so I hope you don't suffer withdrawal symptoms. See you back here soon guys and gals. 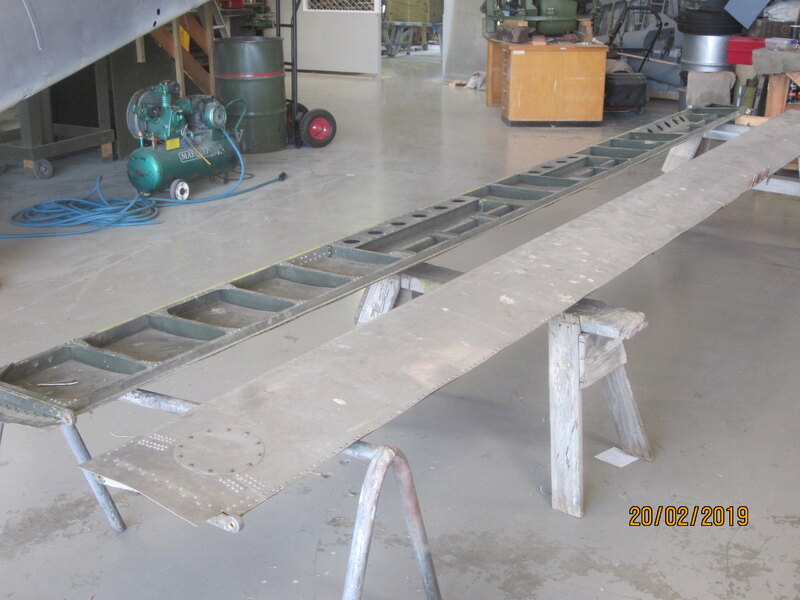 Went in yesterday and finished off the port tailplane and the boys were keen to put it onto the fuselage. I thought that it might be a problem and not sit square and at the right angle after the straightening of the main spar. To my surprise it fitted perfectly and from eyeballing it, it appears to sit just right. 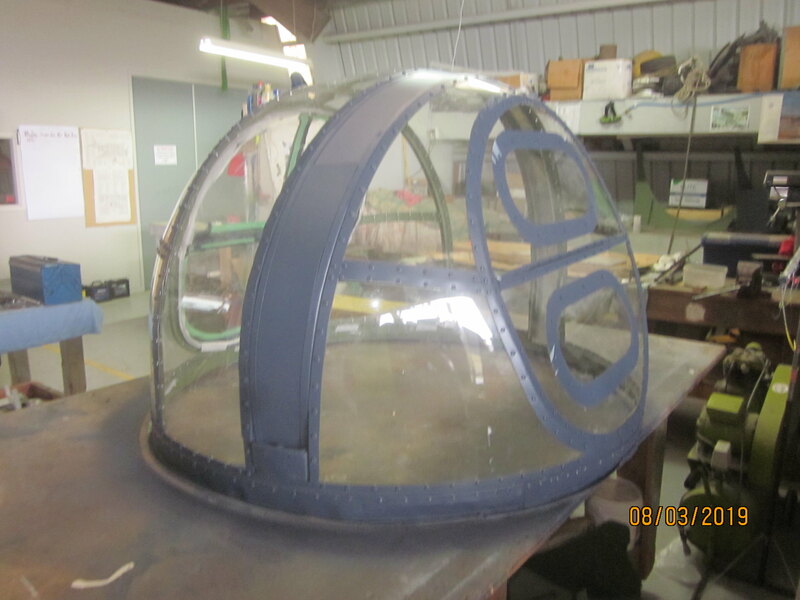 Cal has been spending time masking off all of the turret glass so that the framework can be sprayed in the upper surface colours. He has some patience as I would go up the wall trying to get it all in place. 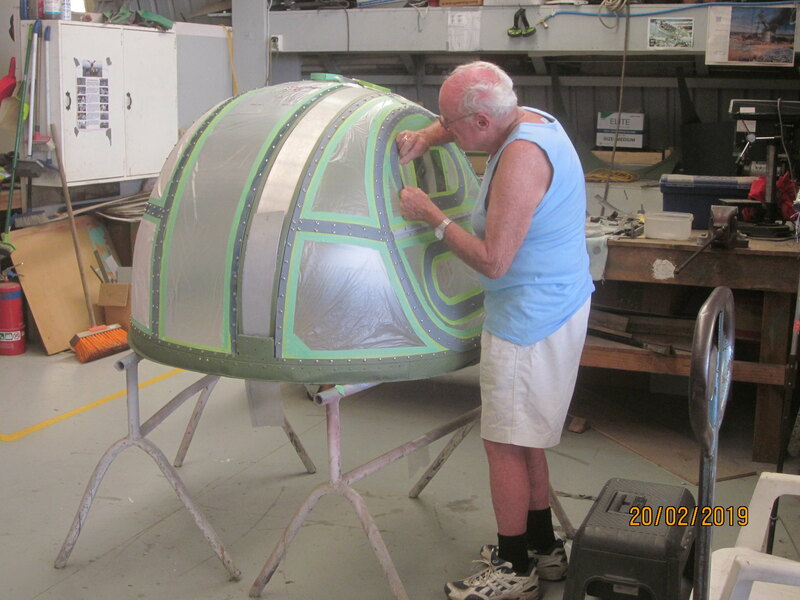 We are missing some of the cowl panels and we have been cogitating on the making of replacement ones. I understand that Ken is due down today and should be bringing a couple of panels so will see what turns up. 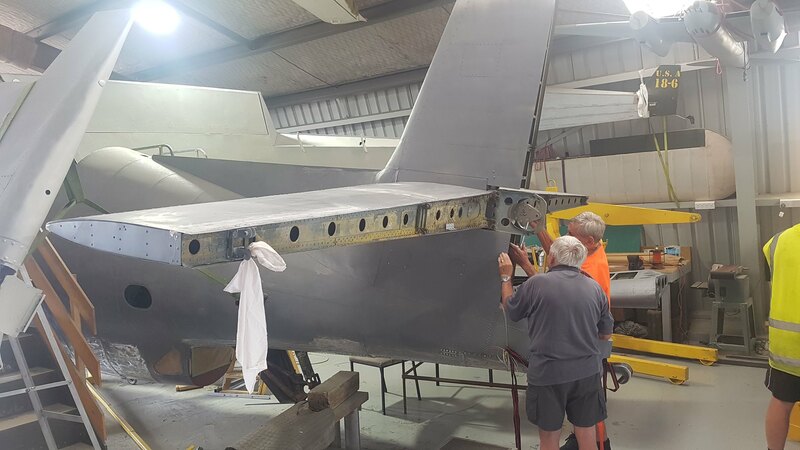 Des took a photo today of the port tailplane finally bolted into place as he couldn't believe that we had finally got there. We went and purchased some of the glue needed for covering so I guess that next week we will be into it. The rudder will be first up as they want to put it in place before the elevators go on. 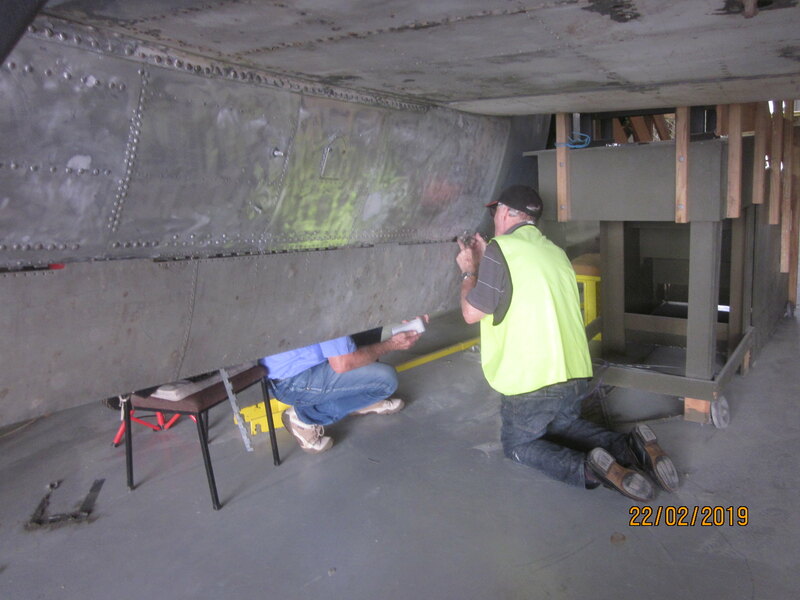 Colin and Bob needed a hand to bolt the outer bomb bay doors in place temporarily in place so that we can get a profile of the two missing inner doors. We are inching closer to the prospect of manufacturing these two from scratch and that will be an interesting exercise. We haven't decided just how we are going to do that but someone will finally decide. As Des is away for a month I had Cal give me a hand today and we made a start on covering the control surfaces. The rudder is the first item and we remembered how it all went together. If we had had an iron available we could have finished covering the rudder but Friday we will finish it. Cal and I did some more covering work today and finished off the rudder and completed one side of an elevator half. 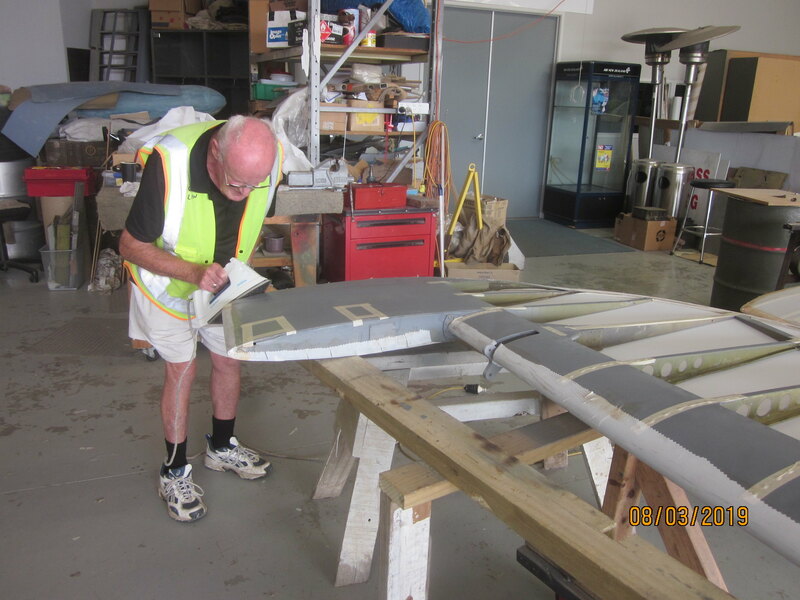 Here are a couple of photos of Cal getting some experience at covering control surfaces. Mind you this is the easy part - rib stitching is the time consuming job. 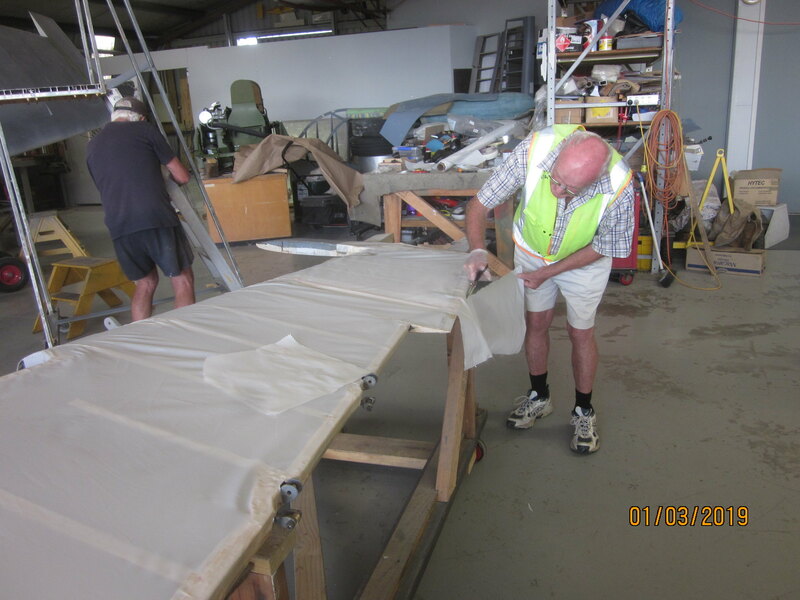 Alan and Dion are working away on making new cowl panels for the Avenger. It appears that there are none of the missing ones available around the countryside so it is down to making them from scratch. Every now and then I hear some words issuing forth and I know that things aren't going too well. But that is what this job is about - figuring out how to make anything that is not available. Cal and I finished the first elevator half and have covered one side of the second elevator. Just one more side to go and then the ailerons and we are done. 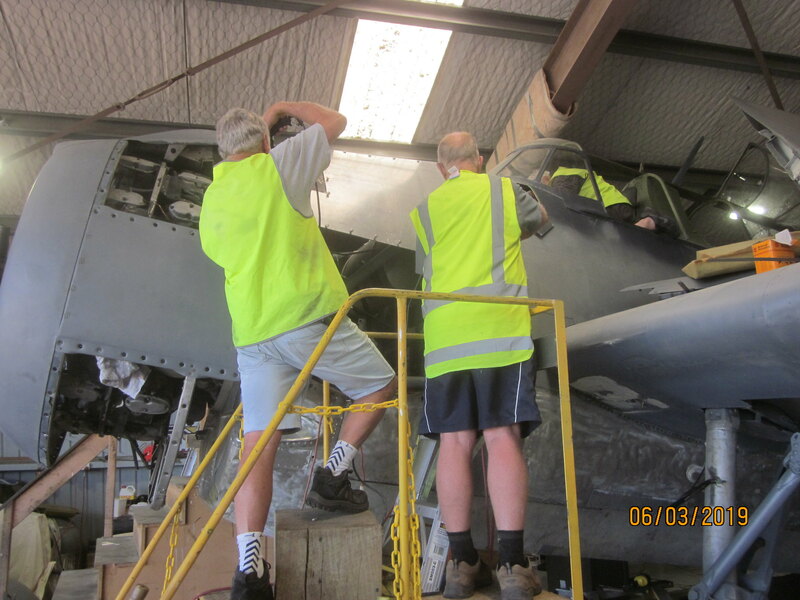 I see that Dave has been busy and installed the pitot head stand off and he tells me that Ken has found a pitot head to go on there so we can throw my reproduction one away. 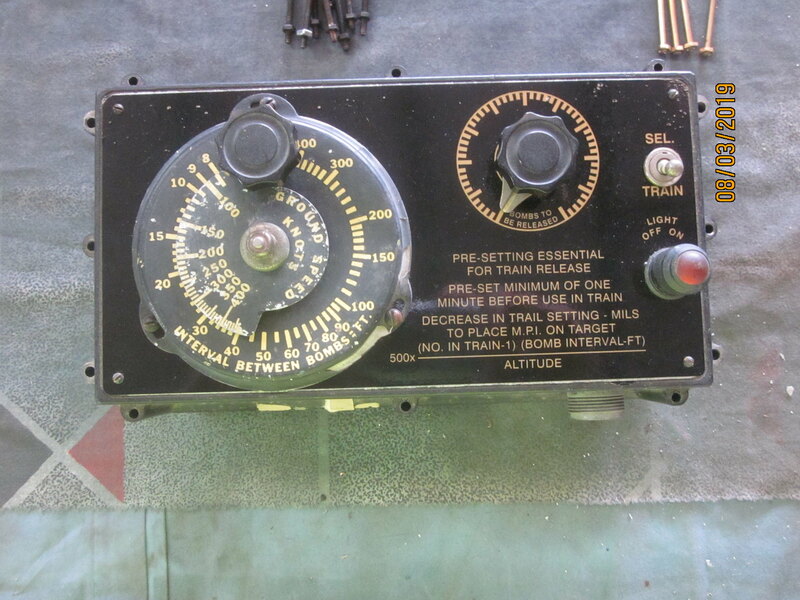 He is also working in the rear fuse and repairing or re-installing some of the fixtures that we have found or made. 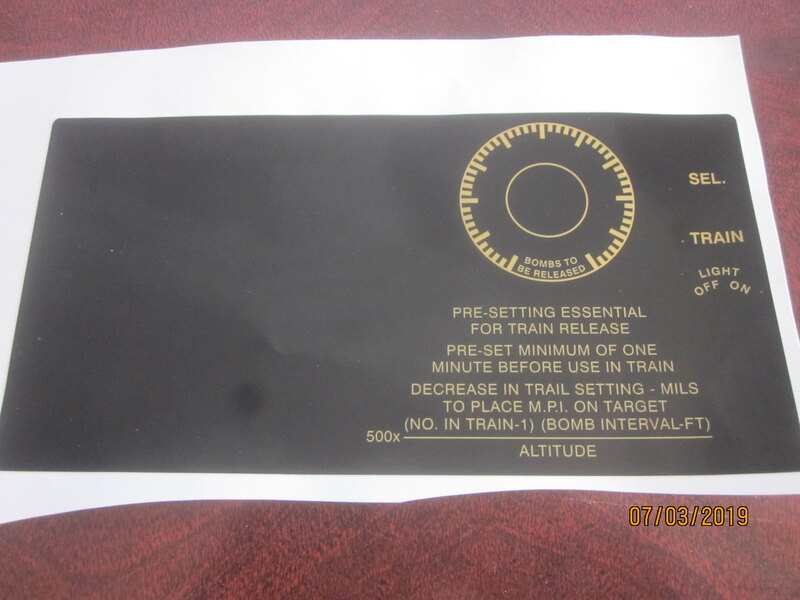 I went to see Marty Cantlon recently about the missing lettering on the intervalometer and he has made a replacement one for us so I can give that to Dave tomorrow and he can figure out how to get that into place on the box top. Today was one of those better days when you seem to be able to achieve things that you need to get done. 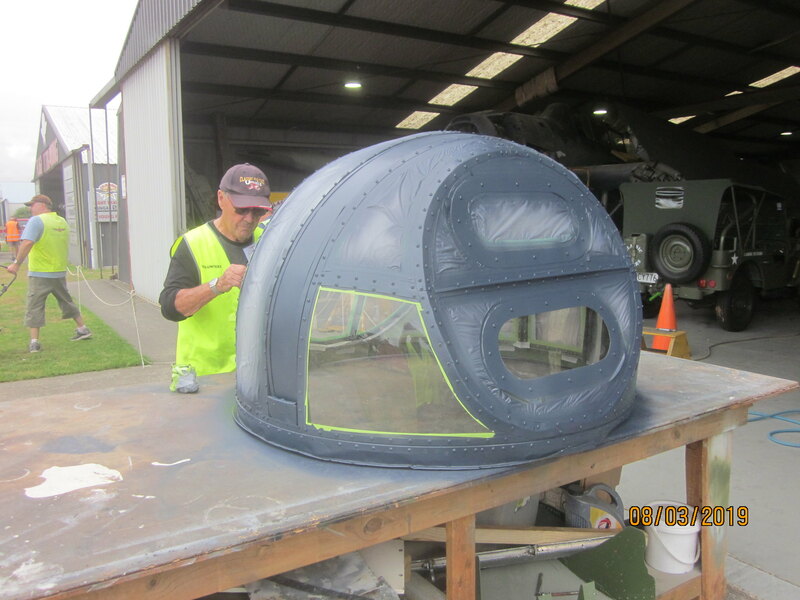 The turret cupola was finally painted today and the masking pulled off. 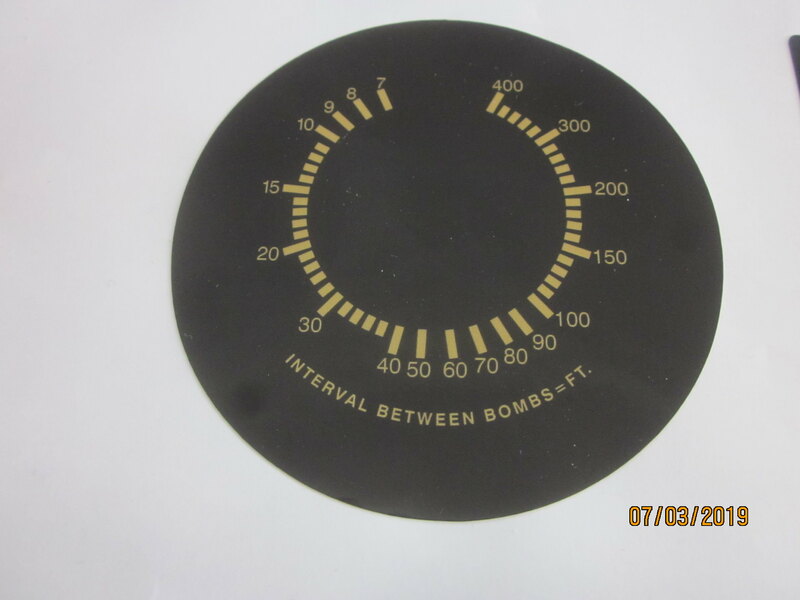 Dave was over the moon to get the new decal for the intervalometer and had it put back together by the time he went home. 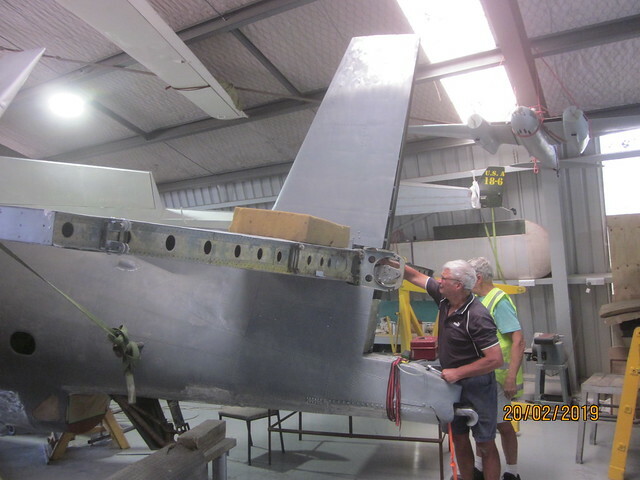 Alan and Dion started cutting out the next panel for the rear centre cowl section but are looking for some photos as this is the one that has the oil cooler door in it. Cal and I finished the second elevator half off and I started on the first of the ailerons. In the photo Cal is practicing his technique for ironing a control surface. All in all a good day. 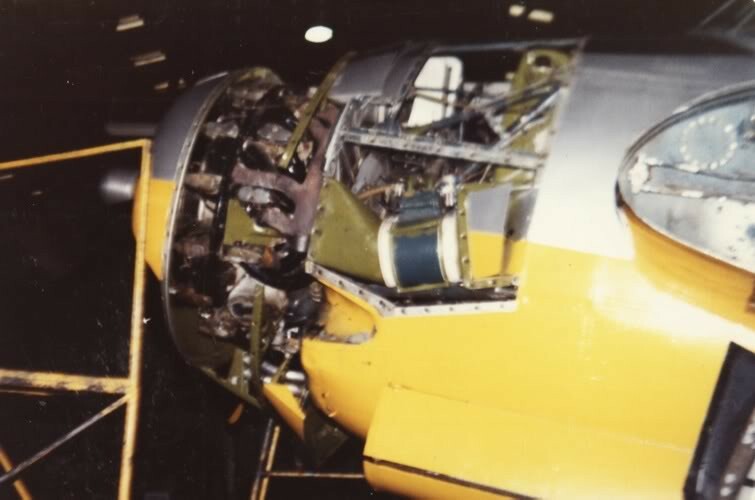 That cowling doesn't actually have the oil cooler flap in it as it sits in a separate structure, so when you remove the cowling the flap stays in place as you can see in this photo of 2504. Is the mounting there for the oil cooler and cooler door? NO - unfortunately all of that structure is missing on both sides. I need to point that structure out to Alan and Dion before they get too far along. It might actually make the cowl panel easier to make. Those bomb bay doors are going to be a real bear to reproduce. Spoke to a guy in the States when we were doing the Ventura who had just done the exercise and he said it was as frustrating as it was difficult. 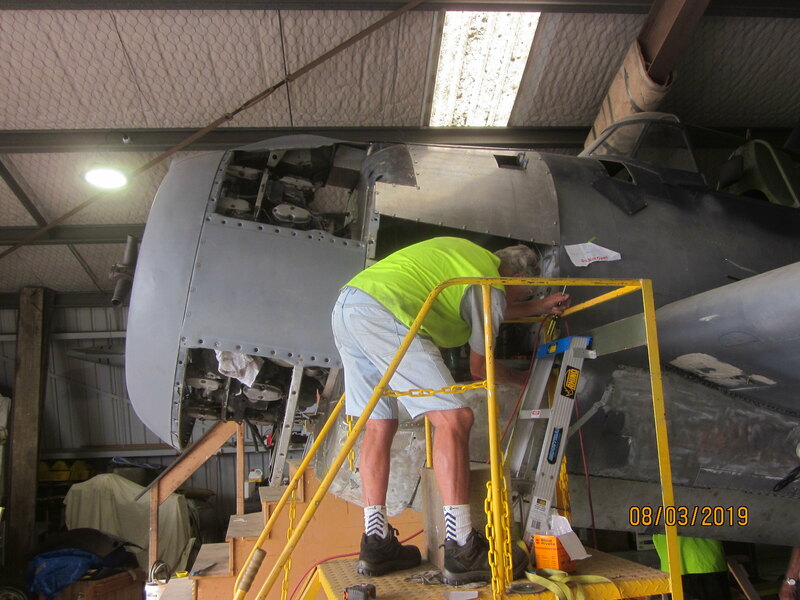 Work on this entire project is just a fantastic reflection of both the skills and perseverance of the restoration crew. If you don't think that just go to Page 1 and the first pic !!!!! Hi Pete, yes when I tell people how the aircraft looked when we received it and offer to pass on the link to this thread it brings it all back. I think that the feeling now is leaning more towards wooden doors as we have a couple of boat builders on the crew. I guess we are inching towards the time when someone will need to finally stick a peg in the ground. We have had a reasonably successful week but unfortunately that photo site is playing ducks and drakes again and I can't post any photos. All of the control surfaces have now been fabric covered so next week it is shrinking the fabric and starting to dope the surfaces then into rib stitching. 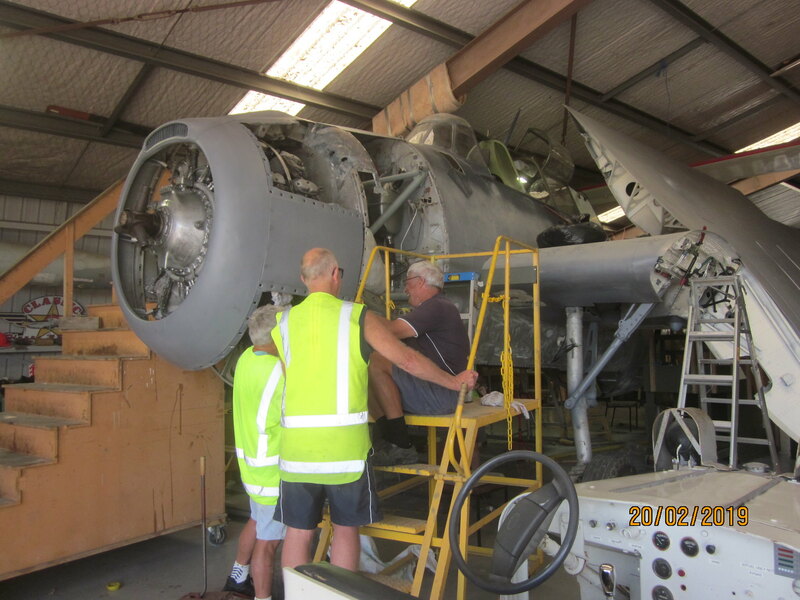 We moved the aircraft out of the hangar today and we have put the turret into place. It wasn't quite as long a job as I expected and now that it is in I cannot see us taking it out again so the attachment of the cupola will have to be done in situ. 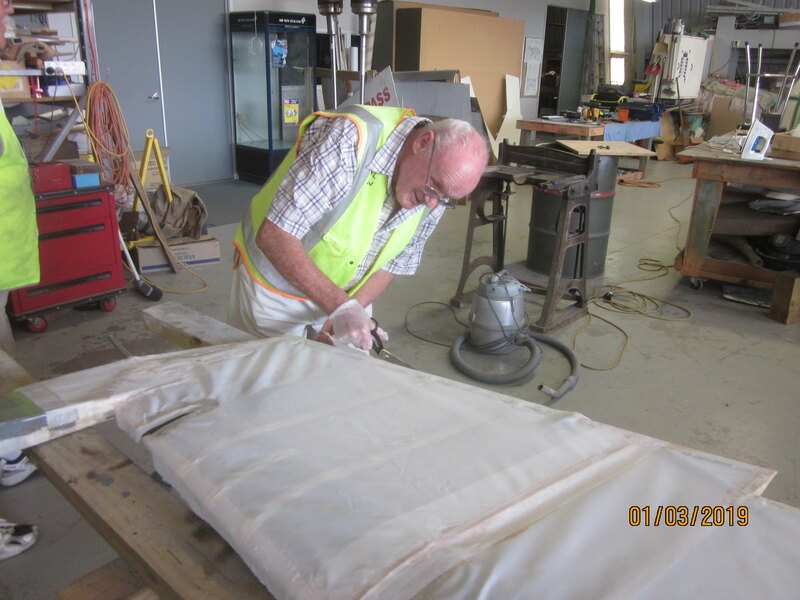 Alan is working on his own this week and is making a great job of making the missing cowl panels. Dave is beavering away in the rear compartment and is sorting out the black boxes and where they go and what we are missing still.